Myanmar’s de-facto leader Aung San Suu Kyi on Thursday defended the seven-year jail terms handed to two Reuters journalists and said their convictions had nothing to do with freedom of expression. 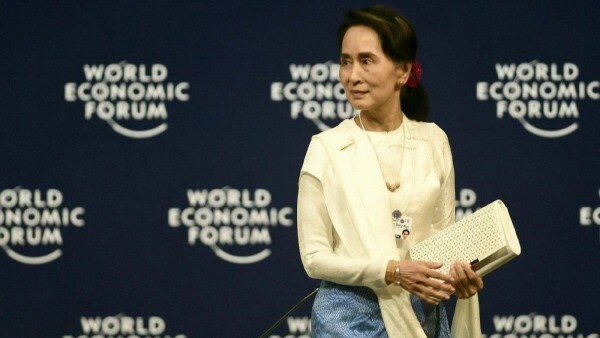 Suu Kyi made the remarks on the sidelines of the ongoing Asean World Economic Forum here, reports Efe news. “If anybody feels that there has been a miscarriage of justice I would like them to point it out,” the Nobel Peace Prize laureate said of the case, which has been condemned internationally. “(The judgement) had nothing to do with the freedom of expression at all, it had to do with the Official Secrets Act,” said Suu Kyi, urging critics to read the judgement and adding that the case had been held in open court with everybody free to attend. “They weren’t jailed because they are journalists, they were jailed because the court has decided they had broken the Official Secrets Act,” she added after being asked by the moderator how she, as a democratic leader, felt about the jailing of journalists. Suu Kyi called for respect for the rule of law, and said the two reporters were free to appeal the sentence. The reporters, Wa Lone and Kyaw Soe Oo, were arrested on the night of December 12, 2017, after meeting two policemen who handed them supposedly confidential documents. One police witness testified in court that the meeting was a setup to trap the reporters. The journalists, sentenced to prison earlier this month, were investigating a massacre of members of the Rohingya minority in Inn Din village in Rakhine state, for which seven Myanmar soldiers were later convicted and sentenced to 10 years in jail. Authorities accused the pair of having obtained secret documents about the military operation in Rakhine, which the Myanmar Armed Forces had launched in 2017 after a series of attacks on border posts by a Rohingya insurgent group. More than 700,000 Rohingyas fled to Bangladesh due to the military offensive, which allegedly included elements of deliberate genocide, according to the UN. During her speech at the forum, Suu Kyi admitted to the moderator that the government could have handled the Rakhine crisis better. “There are of course ways in which we, with hindsight, might think the situation could have been handled better,” she said. “But we believe that for the sake of long-term stability and security we have to be fair to all sides. The rule of law must apply to everybody. We cannot choose and pick whom should be protected by the rule of law,” the leader added.